Fabulous Channel by Giselle Claudino: Wedding Dress para o Astro: So Chic! Wedding Dress para o Astro: So Chic! Speaking of fashion, look at this wedding dress! Aline Morais is one of the best actresses of the young generation in Brazil. She is so talented and beautiful. Most of the designers love her in their criations, how they would not?She is incredible! 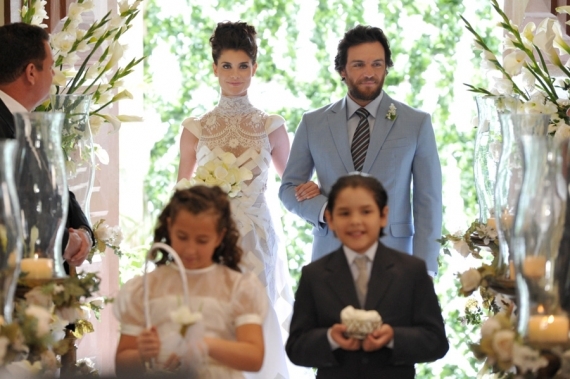 I love her and that's why I am sharing the pictures of the wedding dress she wore at the episode of yesterday's soup opera "O Astro".The soup is a remake of 1978 version and it is aired most of the week nights in Brazil.It was pretty entertaining to watch it while I was in Brazil for 2 and a half months! The creation was made by Brazilian designer Samuel Cirnansck. He chose this amazing fabric, laces and the mix of all pieces together couldn't have another result but a very elegant and sassy dress! Look at the NECK detail! Absolutely LOVE IT! Samuel Cirnansck dress on the Sao Paulo Fashion Week! Miss Universe 2011.Brazil Gets the Third Place!